There’s no Christmas slowdown for UK telecoms regulator Ofcom as it announces another initiative, this time to facilitate switching between mobile providers. Attempting to move from one provider to another in the UK has long been an odious business. Call centers that usually take hours to respond to calls miraculously find ‘customer care’ agents immediately when you call the special ‘I’m thinking of leaving’ line. These specialists are armed with an arsenal of weapons, techniques and strategies all designed to prevent you leaving. Sometimes these are benign, such as offering special deals, but if they fail there appear to be a range of obstacles, penalties and implied threats available to inflict on the hapless subscriber, all designed to make the process of leaving so painful that they’re likely to give up. This has, of course, been the case for decades, but Ofcom has finally got around to doing something about it. 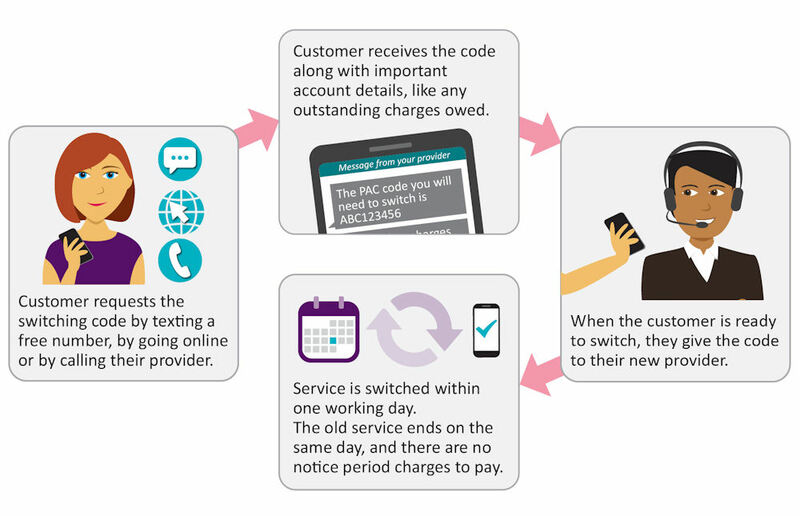 According to the new rules imposed upon UK mobile operators, which they have 18 months to implement, punters can now simply ask for a code – via a text, call or website – and their incumbent provider has to deliver it within 24 hour, no questions asked. Yes, we know that’s a tricky concept to get your head around. Luckily Ofcom has done a little diagram to break it down for you. The biggest beneficiary of this is likely to be Three, the smallest of the major UK MNOs. Three has issued a statement grudgingly applauding the move, but still moaning that it didn’t go further. Three seems to be saying Ofcom should have forced providers to make no other contact with their customer once the code request was received. It’s easy to see why that would serve its own interests but not how this serves the customer. Threatening to leave is one of the best ways to get a better deal from your incumbent provider and objecting to that process does not reflect well on Three. What’s not to like about being offered a discount? USwitch, a price comparison site that makes money from people using its platform to switch providers, is also pleased but still wants more. “It is encouraging to see Ofcom taking steps to make it easier for customers to take their mobile number between mobile providers,” said Richard Neudegg of uSwitch. The gaining-provider led process once more silences the incumbent provider by handing control of the switching process to the new one. Again, while it’s easy to see why this would be in uSwitch’s interest as it would probably increase the volume of switching, it’s less clear how this would benefit the punter.